Don't rule out Cardboard. Over two million children have now experienced Google Expeditions, its VR field trips designed for the low cost headset, and one million of those are in the UK alone. "If you have a school age child here in the UK, there's a good chance they've tried Expeditions, we've just hit the one million student mark," said Peter Falcone, analytical lead at Google, speaking at VR World in London. 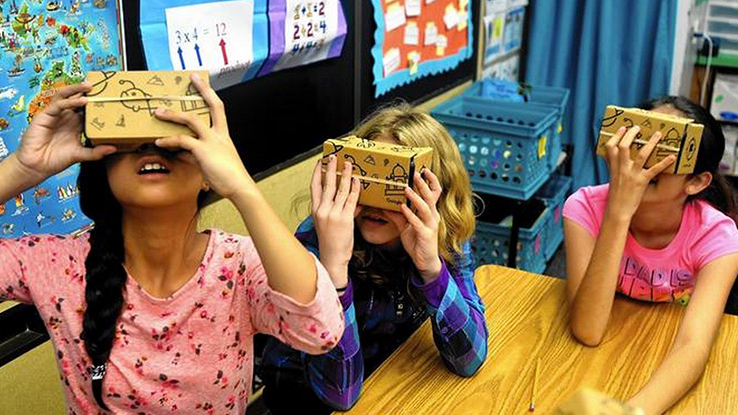 "We've had over two million students experience Google Expeditions." The experiences within the program, which include group 'outings' to the Great Wall of China, Buckingham Palace, the ISS and Jupiter, are strictly curated by Google but the number is rising pretty quickly. "The library of Expeditions is growing. Only a few weeks ago, it was 500 and now we have over 600," he said. Google has been touring schools in the UK since it set out its ambition to reach one million schoolchildren last November and the program will wrap up at the end of May. Kids over the age of seven can try it and engagement has been highest between Years 3 and 6 in British schools i.e. ages seven to eleven. It's not just for kids, though, as Falcone points to adult learning experiences including "career Expeditions" as well as the fact that Google has taken the shared VR learning set up to "parties and old people's homes". Google also used the VR World show to highlight the work of Unfold Stories which has created five Expeditions around global social justice issues including one titled Beating Ebola in Sierra Leone. Others tackle themes like empowering girls in Bangladesh and the lives of refugee children in camps in Lebanon. These stories can be quite "challenging" for school kids according to Unfold Stories' creative director Simon Davis but they come out of the experiences with more understanding than just seeing a news bulletin and questions like how many people the crisis affected. As Google is pushing its new Daydream platform, at least for VR entertainment, we'll wait and see what's in store for Expeditions.